Ca.3 (or Ca.33) of 1917 was the alternative designation of the Ca.450HP, 299 of which were built between 1917 and 1919. 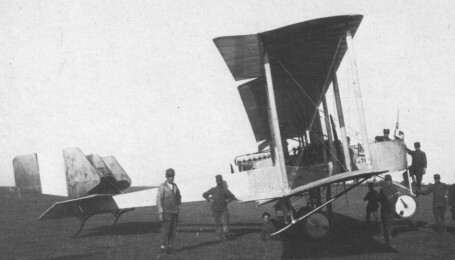 Powered by three 112kW Isotta Fraschini V.4B engines, the normal bomb load was 200kg and defensive 7.7mm machine-guns were mounted over the nose cockpit and in a tubular metal structure just behind and slightly higher than the trailing edge of the upper wing centre section. The Ca 3 (Ca 33) became the major production version, 270 being built. It was characterized by three-bay equal-span wings, and three rudders mounted above the tailplane. In Italian service the Ca 3 was operated by the IV, IX, Xl, XIV and XVIII Gruppi Bombardamenti, and one Italian navy squadron in Albania. Licence production of a further 86 was undertaken in France by the Esnault-Pelterie and SAIB factories, these serving with the escadrilles of the French Aviation Militaire. In addition, wartime and postwar Italian production figures reached 153 examples of the Ca 3 Mod (Ca 36), of which the CAM received 144. These had detachable outer wing panels, and some were converted as ambulance transports (Ca 36 S), carrying four stretchers and up four sitting casualties. In 1925 eight machines were sent to Libya in support of the reconquest of that territory. By the end of 1926, however, the last examples had been withdrawn from first-line service. The mainstream Ca 3 bombers carried a crew of four (two pilots, an observer/front gunner and a rear gunner), with a ring-mounted Revelli machine-gun in the front and rear positions. The rear gunner was installed in an exposed, cage-like structure below and aft of the upper-wing trailing-edge, directly ahead of the rear propeller. Most Ca 3s were used for conventional bombing attacks, but some were also em-ployed briefly as torpedo bombers. Experi-mental variants included models with mod-ified landing gear (Ca 34), tandem pilot seats (Ca 35), shorter-span wings (Ca 37) and a proposed single-float seaplane version (Ca 39). A number of Ca 3 Mods were adapted as mail or six-passenger civil transports (Ca 56a) after the war.